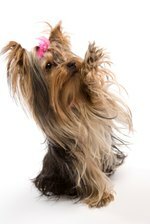 What Are the Causes of Seizures in a Yorkie? A Yorkie may suffer a seizure for a variety of reasons, but the most common are hypoglycemia, portosystemic shunts and hydrocephalus. It's frightening to watch a seizure, which typically happens without warning. During the seizure, he'll drool. His body becomes stiff and he suffers uncontrollable muscle spasms. He may be quiet or may whine. Seizures are a symptom of serious illness; visit your veterinarian for diagnosis and treatment. Buy your Yorkie from a reputable breeder to avoid the problems that cause seizures. Hypoglycemia occurs when your Yorkie's blood sugar dips too low. This condition is common in tiny breeds such as Yorkshire terriers because of their inability to eat large quantities during a meal. As a result, they have a hard time storing enough glucose. Until your puppy weighs at least 2 pounds, feed him every four hours to avoid hypoglycemic seizures. Ask your veterinarian to recommend a high-calorie paste; feed your Yorkie a quarter-teaspoon twice per day. Teacup Yorkies and runty dogs will need continual meal monitoring throughout their lives to avoid hypoglycemic seizures. The portal vein normally moves blood from your Yorkie's stomach to his liver and removes ammonia from the blood. A portosystemic shunt results when a vein grows side branches, bypassing the liver. The shunt keeps blood from being detoxified and affects absorption of nutrients. Symptoms of a portosystemic shunt include stunted growth and frequent hypoglycemic episodes. Some Yorkies have neurological problems as a result of this condition. Surgery redirects blood flow and cures the condition. Though shunting begins to occur soon after birth, by the time a Yorkie is 2 years old he'll exhibit symptoms if he's affected. A low protein diet helps alleviate symptoms. Hydrocephalus causes the ventricles of the brain to fill with extra cerebrospinal fluid that puts pressure on brain and damages it. This genetic condition is present at birth; affected puppies have domed heads and wide-set eyes. Your veterinarian can diagnose your puppy by the time he's 4 months old, using CT scans. It's possible to install a shunt for drainage with surgery, but the shunt must stay in place permanently. A Yorkie with hydrocephalus will require extensive veterinary care throughout his life. Buy your Yorkie from a reputable breeder to avoid this. Monitor your Yorkie while he's suffering a seizure. Place him on the floor where he won't fall. Don't put your fingers or other objects in his mouth. Other dogs in the house may become anxious when your Yorkie has a seizure; they may even be provoked to attack. Remove them from the room and keep them separated during the event. A seizure may last 30 seconds or several minutes; time the seizure if you can. Stay with your Yorkie until he regains consciousness. Make notes, including what your pup was doing when he started seizing, what and when he last ate, and any other behavior changes. A thorough history can help your veterinarian reach a diagnosis. If a seizure lasts longer than five minutes, or if your Yorkie suffers several seizures in a row, seek emergency veterinary care. Seizures raise your pup's body temperature, which can result in brain damage.